Master Class and Affiliate Workshop students will be accommodated in the comfortable and well appointed rooms of the four star Relais Falisco Hotel. The majority of the hotel’s rooms provide single and double accommodation. Subject to availability, there is the option of a triple room. All rooms have en-suite bathooms, telephone, refrigerator and are climate controlled. All linen and towels are provided, and rooms are cleaned daily. Wifi is available in all common areas. The Relais Falisco Hotel provides an elegant breakfast for its guests and a continental breakfast on excursion and departure days. NOTE: The 7 single rooms of the Relais go quickly; if you want a single, APPLY EARLY! When no more singles are available, you will be assigned to a Double Used as a Single (DUS) and charged accordingly. Alternatively, Master Class or Affiliate students may opt for single room in shared apartments. 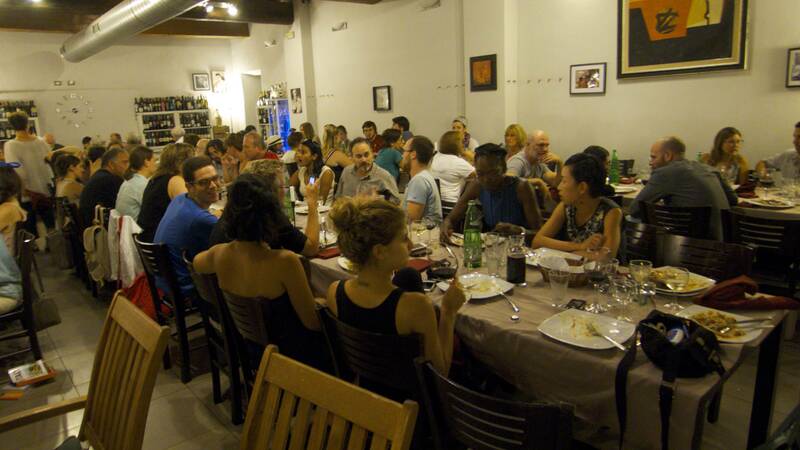 Every Monday evening all JSS in Civita participants gather for a communal meal at one of Civita’s marvelous and authentic restaurants (included in tuition). All other meals are available at your choice of Civita Castellana’s many and varied slow-food bars, restaurants, rosticcerias, wine bars, bakeries, health food stores, pizzerias, and supermarkets. (All restaurants have vegetarian options). Participants often form groups to dine together. Those who choose apartment living have the option of cooking for themselves using the town’s convenient array of supermarkets, minimarkets, delis, bakeries, cheesemakers and farmers’ market. A map of these establishments will be supplied to all participants. Participants in the Artist Residency Program will be accommodated in shared local apartments on a first-come first-serve basis, subject to availability, after which they will be accommodated at the Relais Falisco Hotel, at an additional charge. Students or participants of limited means have the option of requesting accommodation in our economy priced dormitory residence. Dormitory rooms are limited and are on a first-come-first-served basis. Dorm living is suited mainly to younger students. Civita Castellana boasts a seductive and charming array of dining out options, or for the do-it-yourself foodies; out-of-this-world local bakeries, cafes, grocery shops, fruit & vegetable vendors, farmers markets (both in and around the town) and an outrageously good fresh pasta (pasta fresca) shop – you can’t eat bad if you tried! Civita is not a tourist trap and all this fare is very reasonably priced whether dining out or cooking it yourself – just really fine regional slow food that would suit the most discriminating of palates! La Fattoria Lucciano: Absolutely the best mozzarella we have ever eaten anywhere – easily categorizable as hard-to-believe-anything-could-be-this-good! Situated near the old Borghetto tower, the Fattorria Lucciano is a gorgeous farm, organic since the 1970s and produces cheeses, yogurt, grass-fed meats, olive oil and wines. The Mozzarella is made fresh daily. The yogurt too is divine! Fattoria Cavalieri: The best fresh ricotta we have ever tasted, hands down! Here too, all their products are of exceptional quality, whether it’s the fresh raw milk (latte fresco appena munto), the ricotta, mozzarella or provolone, this is the real deal! Fattoria Cavalieri’s sales-point outlet is conveniently located in the new part of Civita, on Via Giornate di Napoli 4. Formaggi Chiodetti: Exquisite Pecorino cheeses, both aged and young. The aged pecorino Falisco is transcendent. Make sure you try their: Fiocco della Tuscia, Buono della Tuscia, and smoked mozzarella. Exceptional cheesemaking artisans. Chiodetti is located on the Via Flaminia 79, Civita Castellana. Pasta All’uovo: Fresh made pastas right in the historic heart of Civita Castellana on Via San Gregorio across from the ancient Romanesque church of San Gregorio. Luca the proprietor will tell you exactly how many minutes and seconds the amount of pasta you are purchasing needs to boil. The take-out Lasagne ai Carciofi is nirvana! Cimina Funghi: The ultimate – Fresh truffles (tartufi), both white and black, as well as fresh porcini and ovoli (Amanita Caesarea) mushrooms and assorted local specialty products. Cimina Funghi is located in the nearby town of Ronciglione, Via Cassia Cimina. Welcome to Arcadia!